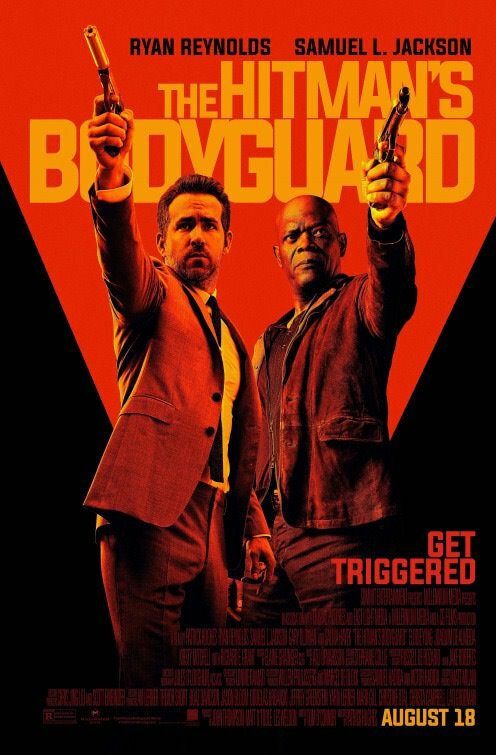 Despite an international cast, director Patrick Hughes stylistically violent action film The Hitman’s Bodyguard becomes a warped buddie movie with Samuel L. Jackson starring as Darius Kincaid a foulmouthed assassin who unwillingly teams up with the executive protection agent Michael Bryce played by Canadian Deadpool star Ryan Reynolds. After an explosive opening sequence in Manchester, England and then followed by an equally hectic sequence in Coventry, Bryce is tasked with transporting Kincaid intact to the International Criminal Court in The Hague, Netherlands to testify against evil Belarussian dictator Vladislav Dukhovich played by Oscar nominee Gary Oldman (Tinker Tailor Soldier Spy) complete with dodgy accent. What was Gary Oldman thinking appearing in such a film? Then again what was another Oscar nominee Mexican star Salma Hayek (Frida) thinking appearing as the equally foulmouthed Honduran jailbird Sonia Kincaid wife to Darius? Even the two sequences with Hayek and Jackson are drizzled in bloodshed which is pitiful considering that it detracts from any potential onscreen chemistry. Clearly all the stars involved in The Hitman’s Bodyguard did not act in this film to further their careers. Then again, obviously the director of The Expendables 3, Patrick Hughes knows that his audience is not going to take the film too seriously if he packs The Hitman’s Bodyguard with excessive violence that the film becomes stylistically nauseating especially considering the events that are currently happening in 21st century Europe including multiple random acts of terror in every city from London to Barcelona. The only redeeming feature of The Hitman’s Bodyguard besides the onscreen sparing between Reynolds and Jackson is the multi chase sequence in Amsterdam involving a ski boat, motorcycle and various vehicles along the Dutch canals. Action fans will be satisfied as basically every city featured in The Hitman’s Bodyguard gets shot at and blown to smithereens from Manchester to Amsterdam to The Hague. Unlike director Edgar Wright’s excellent Southern crime caper Baby Driver, the action sequences in The Hitman’s Bodyguard is repulsively manufactured and the violence is deliberately pornographic. The story is definitely thin on content which underscores the question why such normally bankable stars including Ryan Reynolds, Gary Oldman and Samuel L. Jackson would consider acting in such an excessively violent film without a pause to think what the real cinematic message conveys: That violence is acceptable internationally? Even the brief appearances by character actors Richard E. Grant and Portuguese star Joaquim de Almeida as a sinister Interpol agent do not redeem the narrative in any significant way. The Hitman’s Bodyguard gets a film rating of 6.5 out of 10 and is big on action, violence, bloodshed and a massive body count (mostly of mean looking Belarussians) and low on nuanced content. Entertaining to an extent but way over done. Sylvester Stallone reunites with all his 80’s action hero stars for a reminiscent action adventure film culminating in Zorro, the guy from Lethal Weapon along with Arnie, Indiana Jones and of course Rambo all fighting it out on the big screen. 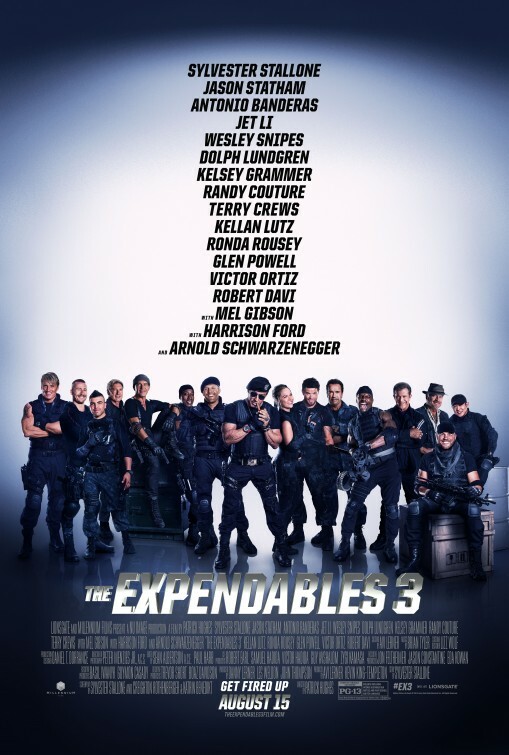 The Expendables 3 is a fun action romp with lots of old and new cast members following on the success of the two previous films which basically gave a very flimsy premise for all these aged action stars to have an onscreen reunion amidst blowing everything in sight. The fact that all 3 Expendables movies is always released on South African screen during woman’s month is ironic to say the least. One has to satisfy the male population some how. 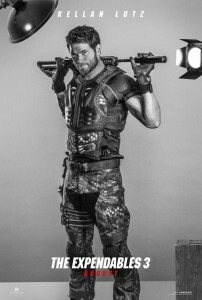 Stallone plays Barney with Jason Statham as Lee Christmas who along with the rest of the Expendables cast add some new younger and savvy crew led by the cocky Smilee played by a buffed up Kellan Lutz who has come along way from the Twilight Days. 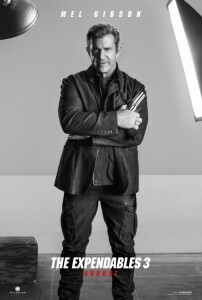 Together both crews set out to destroy the evil and manic arms dealer Conrad Stonebanks, wonderfully played by Mel Gibson, a former Expendables co founder and now nefarious and ruthless criminal with a penchant for expensive art. 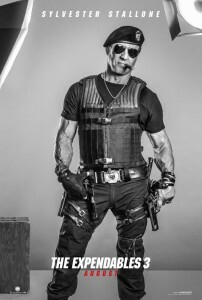 As the action moves swiftly from all the usual international honeymoon spots like Mogadishu, Somalia to Armenia, (actually Bulgaria) in the film, The Expendables 3 does not pretend to be anything more than popcorn fodder with loads of action some witty one liners and a flimsy plot thrown in. Its also a fantastic chance for Wesley Snipes (The Blade Trilogy) and Arnold Schwarzenegger (Terminator) to redeem their forsaken Hollywood careers along with Antonio Banderas (The Legend of Zorro) and more importantly Mel Gibson (Lethal Weapon). The Expendables 3 is great entertainment if viewers enjoy a bunch of old dogs of cinema blowing things up and getting the bad guys. There are some amazing stunts, the narrative is flimsy punctuated by some hilarious moments provided by Banderas, Snipes and of course Oscar Winner Mel Gibson. It is also evident that clearly the 2008 economic recession is still affecting Hollywood if all these actors from the eighties and nineties still need to take part in sequels. The main thing is, at least they haven’t retired and are still entertaining audiences 30 years later as the cinema was packed when watching this action flick. Recommended viewing for serious action stars and clearly not aimed at female audiences despite the presence of female wrestler Rhonda Rousey who adds some glamour to this aged group of bandits. Watch out for Kelsey Grammer (last seen in Transformers: Age of Extinction) as Bonaparte, a sort of mercenary recruiter who is always good value.